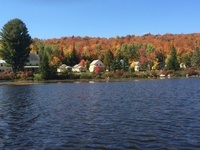 Quimby Country is a cottage resort in Vermont’s Northeast Kingdom that has been hosting families, anglers, and outdoor enthusiasts since 1894. Rich in history, Quimby’s Lodge and cottages sit by themselves on the shores of Forest Lake in the Great North Woods of Vermont. And the crystal clear waters of Big Averill Lake are a short 10-minute walk away. 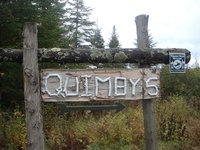 Quimby’s offers three-season accommodations in our 19 well-kept, pet-friendly cottages. Nine of the cottages have kitchens and all 19 have wood stoves, full baths, porches overlooking Forest Lake, comfortable beds, and daily housekeeping service. In addition, the main lodge has a fireplace, library, and supply of board games. A separate recreation hall provides space for crafts and games on rainy days and square dances on some evenings. Wireless Internet Service is available in the main lodge, along with complimentary long distance phone calls. In summer, guests enjoy sit-down meals in our comfortable dining room, as well as a lakeside barbecue and a lobster bake. Picnic lunches are available for those on the go. Complimentary camp counselors arrange day & evening activities for youngsters & their families. In fall and spring, guests can enjoy complimentary continental breakfasts in the lounge. Picnic lunches are available for purchase. And guests can take advantage of casual or fine dining within a half hour of Quimby Country, including in Quebec’s Eastern Townships.